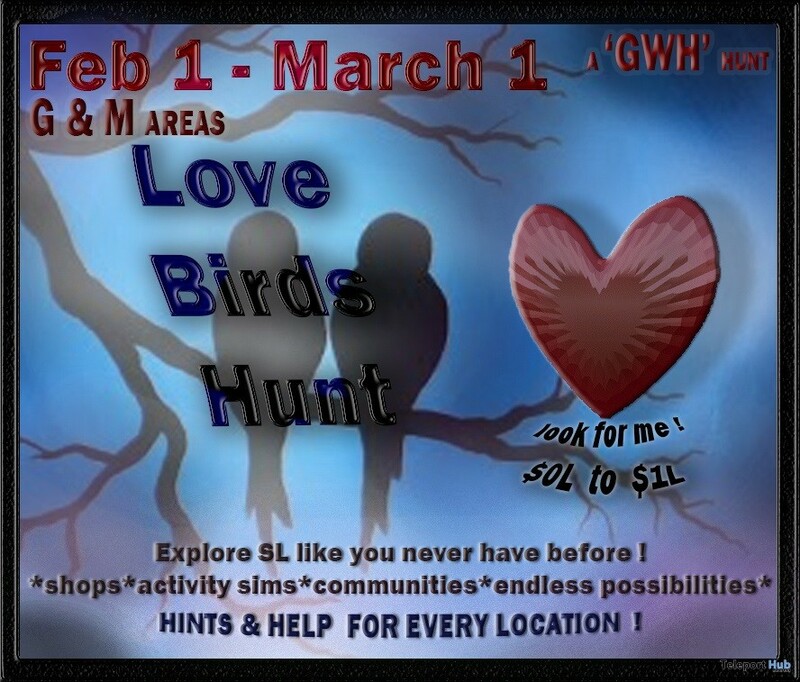 GWH LoveBird Hunt 2019 – The GWH “Love Birds” Hunt is a friendship, love, & aviary themed hunt. It’s appropriate for all ages and not ‘romance’ or ‘couples’ specific. Areas will be M and G rated (no Adult sims). Each GWH location provides at least one unique prize item (often more than one) that best represents their area of expertise. GWH’s are not your standard hum-drum items. ​ We encourage each location to provide new and unique items that show off their area. Expect a variety of items from decor, clothing, HUDS, interaction items, a wide range of SL interests, creative design skills (sometimes ‘experimental’ ideas), and loads and loads of fun landmarks & activities! Some areas offer experiences you may never have known were IN secondlife… so get ready to explore!